My friend, Chris “Groff” Groff, had the great idea to work up some holiday lights using stuff he had lying around, and a few hours later things turned out quite geeky indeed. We ended up using Bawls bottles both because Groff was a fan of the deep blue color and he happened to have a case of them laying around, but obviously you can use any bottle you want. 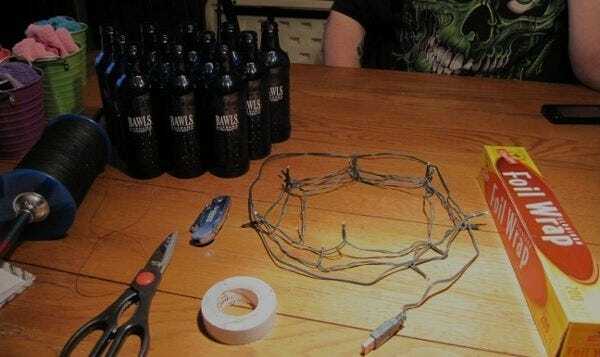 First, we lined the inside neck of the bottles with some aluminum foil to direct the light downwards. We cut small 1”x 2” pieces of foil, rolled them up tightly, added some tape to the back of them, and set them in the neck of the bottle. Remember to roll them with the shiny side on the inside. Let gravity stick the roll inside, and then use a pen or you finger to slowly unroll the foil. 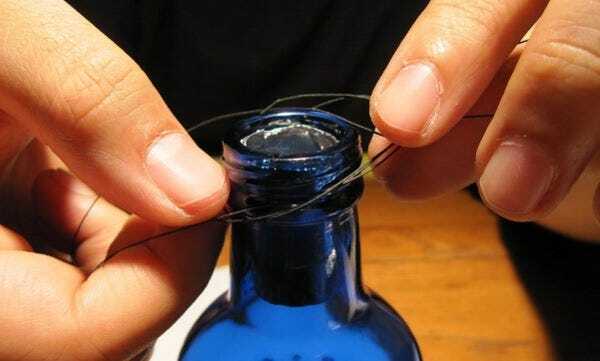 It takes two per bottle, and having some needle-nose pliers helps to insert them more accurately, if you’re having trouble. 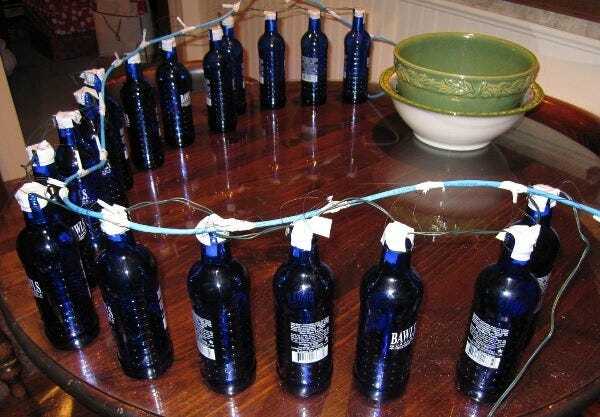 Next, we put some of the thin string around the bottles to hang them. 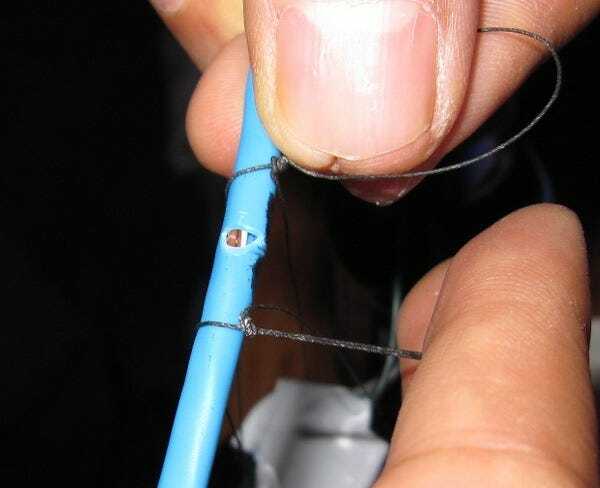 I had some heavy-duty kite flying thread laying around, but braided fishing line is cheap and works just as well. 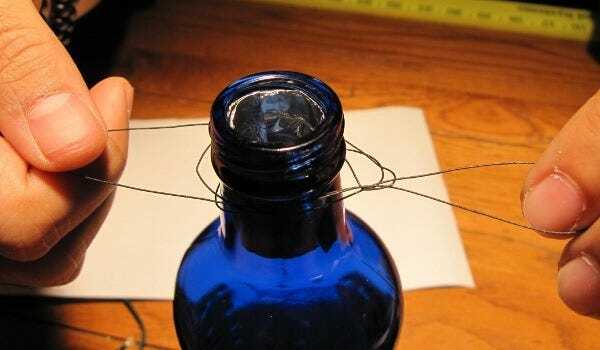 I tied a bottle sling knot, which is designed to fit under the lip of a bottle and is very sturdy. It’s also called a jug sling knot, but you could use anything else that’ll hold the weight. We used 30” lengths of string and then adjusted the excess to make loops of equal sizes to hang them from. As mentioned above, we used a string of white USB LED lights (from thinkgeek.com) because they worked well with the blue Bawls bottles, but any kind of lights work. 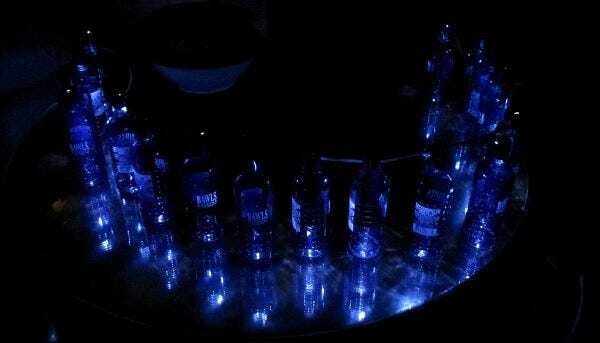 We dropped the lights into the bottles and taped over them. 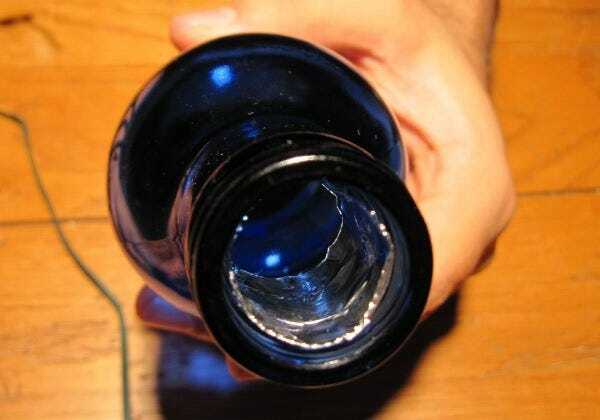 Something we found out in retrospect was that standard 2-liter bottle caps fit over the ends if you push firmly, so that’s something you may want to keep in mind to avoid the tape. We happened to have a spool of Cat5e hanging around, so we used that to hang the lights up and for easy transport. We spaced out the bottles and ran the cable through the looped string. We cut some notches for the loops to sit in, and then taped them over so they wouldn’t move. Be sure to keep them close enough that the lights’ wires don’t have too much stress on them. These are perfect for hanging off of your porch, around your desk, or perhaps along your cubicle walls. 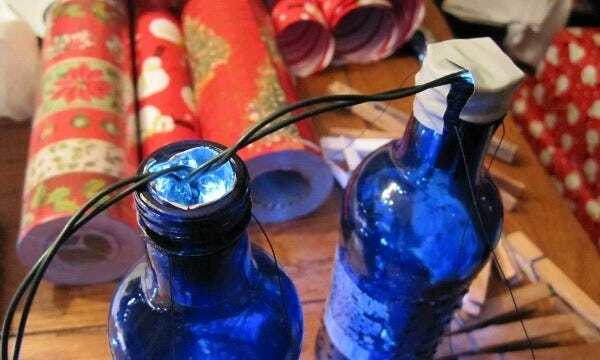 Bonus geek points: You can modify our setup with LED throwies, taping them to the inside of a bottle cap, and end up with individual bottles that are unencumbered by wires. Perfect for Christmas trees and wider-scale deployment!